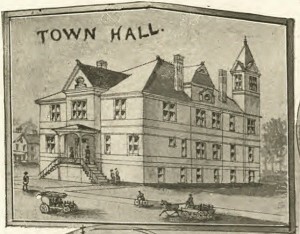 Built in 1890, the three-story Plainville Town Hall quickly became the center of daily life in town. Housing the library, police department, and fire department, as well as offices for, among others, the local probate judge and the town clerk, the building played an indispensible role in providing residents with municipal services—that is, until December 4, 1917. On that day, drawn by the smell of smoke, first selectman William J. Johnson discovered a fire in the Town Hall sparked by defective wiring. Municipal workers evacuated the building and the fire department (conveniently housed on the first floor) quickly began removing equipment from the burning building in an attempt to fight the blaze. Because the wiring in the building malfunctioned, the fire department’s alarm whistle was disabled, making it necessary for nearby businesses, such as the Bristol Manufacturing Company, the Electric Manufacturing Company, and the Elm City Brass Company, to blow their whistles in order to raise the alarm. As the fire spread, workers brought coal chutes from the nearby Plainville Lumber and Coal Company and placed them up against windows in order to save books from the library. Workers also managed to save a variety of other materials, including ammunition, rifles, and a machine gun stored in the building for the Machine Gun Battalion of the local Home Guard. As fire departments from Bristol and New Britain arrived to help douse the flames, local factories shut down to provide increased water pressure for firefighters. 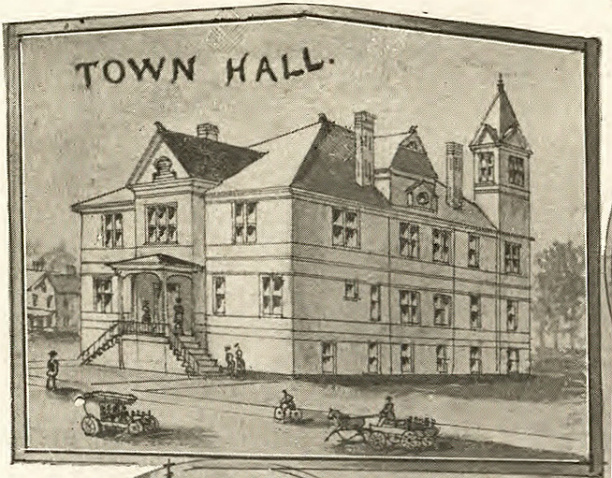 After the fire, numerous meetings took place in Grange Hall to decide the fate of the town hall building which still stood but without much left of its first and third floors. The search for a location in which to erect a new brick building ended upon the realization that the shortage of construction materials caused by U.S. involvement in the Great War made razing the old town hall and building a new one too costly. Instead, Plainville leaders decided to renovate the existing Town Hall and open it with a revised floor plan. More than 50 years later, on December 16, 1973, the town of Plainville opened a new Municipal Center, making the old Town Hall obsolete. Town officials left the nearly 100-year-old building in the hands of the Plainville Historical Society, which, having restored the building’s original floor plan, rededicated it as the Plainville Historic Center. “Plainville Historical Society,” 2016. Link. Bailey, O.H. 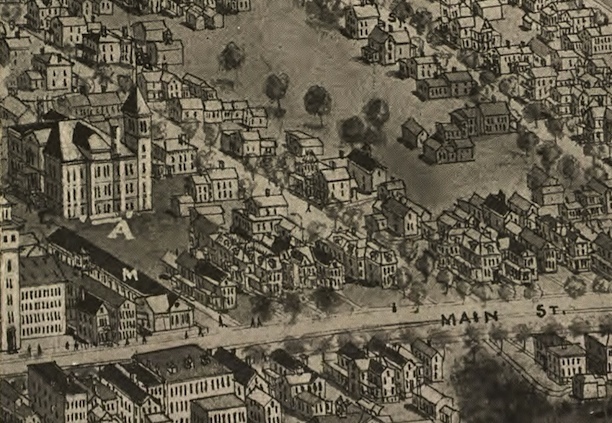 “Bird’s Eye View of Plainville, Connecticut 1907.” Bird’s-eye. New York: Hughes & Bailey, ca 1907. University of Connecticut Libraries, Map and Geographic Information Center - MAGIC. Link.